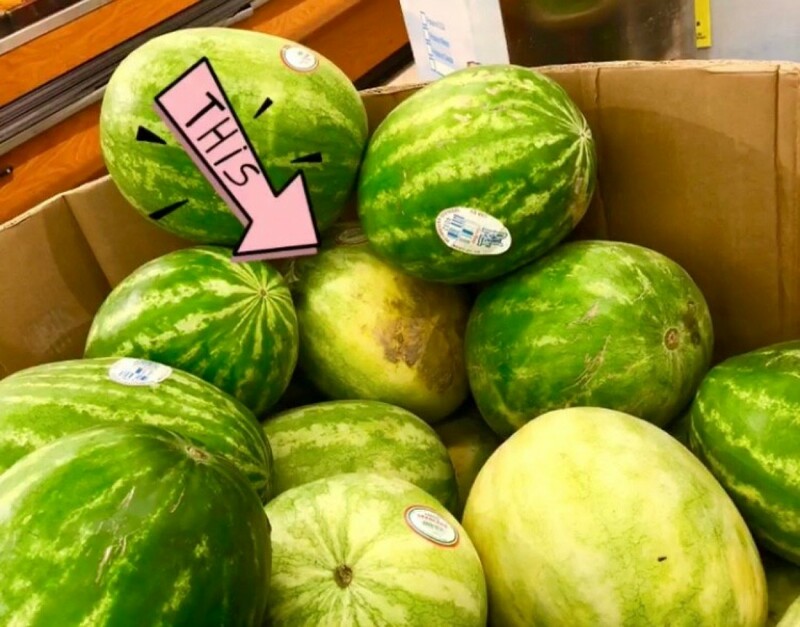 Have you found yourself in the produce section trying to remember how to tell if a watermelon is going to be sweet and tasty? Should you thump or check the stem end? A green melon can be a big disappointment. This is a guide for selecting a good watermelon. The best tip I ever got for selecting a good, ripe watermelon came about 25 years ago from a very old black man I met in a grocery store. He was standing there by the watermelons trying to balance a broom straw on a watermelon. I just had to stop and watch him to see what in the world he was doing, and of course I had to ask him also. He explained to me that this was the very best way to find a ripe watermelon, that it never fails! You take a broom straw, balance it carefully across the melon, then turn it loose. The straw will start to wobble, then spin. The faster it spins and the more times it goes around, the riper the melon is! He said it had to do with the water content in the melon, the juicier it was, the more it moved the straw. This is apparently based on the theory that "water witches" use with divining rods to find water through the magnetic property of the water and since I thoroughly believe in water witching, I believed him! He showed me how to do it and helped me pick out a good melon by just using the straw. He said when he knew he was going to buy a watermelon, he took his own straw to the store with him. If he happened to not have it with him, he went to the housewares dept of the store and broke a straw off a broom to use. Amazingly enough, when I cut the melon open later, it was one of the juiciest most flavorful melons I'd had in a long time. So for a long time after that, I carried a broom straw in my purse and I never got a bad melon! Of course I got stares and questions, so I passed on the words of wisdom given to me by the old man. I also taught family members and friends what I'd learned. They've all told me at one time or another that it's been the most accurate way they've been able to pick melons out! My mom actually gets a big kick out of doing this at the store even now! I ended up standing there for over 30 minutes, having the most enjoyable conversation with that wonderful man about the way things were when he was a youngster way back when! Source: A wise old man I met in a grocery store in Arizona many years ago. As watermelon season wraps up, we are seeing tons of them on sale. You want to make sure you choose a good one, or else you'll be stuck with 15 pounds of lackluster fruit. The key to finding a good one by sight is looking for a rather ugly one that has a big yellowish patch on one side. That spot indicates how it was resting on the field. The darker the yellow, the longer it's been sweetening up. If you do not see one of these spots, it is underripe. Try to find one that's uniform in shape, whether it is round or oval. If you see irregular bumps, it was not getting proper water or sunlight, changing its taste. Little brown scuff marks on the melon are also good. They are an indication that sugar is coming out of it, which means it's even sweeter. You should also give it a knock with your knuckles. A muffled hollow thud means it's a good one, and a higher pitched ringing sounds means it is unripe. In my photo, I added a pink arrow so you know which one we went with, and it was PERFECT! My friend's dad was in charge of the produce section of a big grocery store for years. He gave me all these pointers. The best tip I heard for choosing a ripe watermelon, is to find the darkest green one you can find without any bruises or soft spots. Choosing Watermelons. When choosing a whole watermelon, I always thump the melon with my fingers. The one that I choose has to sound "hollow". . . I always check the bottom of a watermelon. It should be yellow where it has laid on the ground. The more yellow, the better the melon. I always thump the watermelon to tell if its ripe. If it sounds hollow like a loaf of home baked bread then its ripe. I have never had a bad watermelon with this technique! The "bottom" of the watermelon (the side that was lying on the ground while it was growing), is usually a white color. 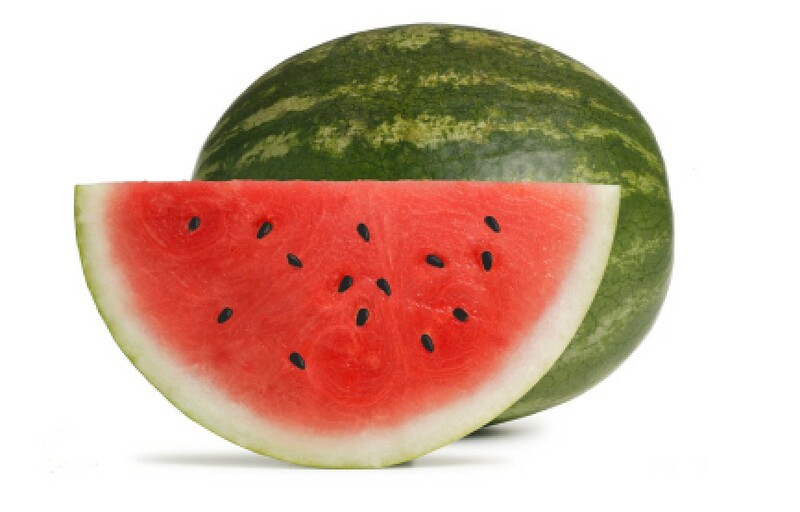 When it has turned a deep, creamy yellow, the watermelon is ripe. To select a watermelon, I use the thumping method by knocking on one with my knuckles. If it has a hollow sound to it, it usually is very sweet.